Canon U.S.A. and two-time Academy Award winner Ron Howard have officially launched the “Project Imaginat10n” Film Festival. Following yesterday's premiere of ten short films at Lincoln Center in New York City, screenings will be held in Los Angeles, CA hosted by Bryce Dallas Howard, the first graduating director of Canon’s Project Imagin8ion as well as in Brooklyn, NY hosted by James Murphy, a celebrity director for Project Imaginat10n. Yahoo Screen will continue celebrating the Film Festival from today through the end of the year where consumers can view each of the 10 films including "...And She Was My Eve” by Jamie Foxx, Celebrity Director, “Out of the Blue” by Eva Longoria, Celebrity Director, “A Dream of Flying” by Georgina Chapman, Celebrity Director, “Little Duck” by James Murphy, Celebrity Director, “Evermore” by Biz Stone, Celebrity Director, “Dominus” by Arrius Sorbonne, Winning Director, “Chucked” by Jared Nelson, Winning Director, “Here and Now” by Julian Higgins, Winning Director, “A Day in the Country” by Kálmán Apple, Winning Director and “Filter” by Ronnie Allman, Winning Director. MELVILLE, N.Y., October 24, 2013 – Canon U.S.A., Inc., a leader in digital imaging solutions, and two-time Academy Award® winner Ron Howard, are officially launching the “Project Imaginat10n” Film Festival, which will kick off with the global premiere of ten short films at Lincoln Center in New York City today. Following the premiere, screenings will be held in Los Angeles, CA hosted by Bryce Dallas Howard, the first graduating director of Canon’s Project Imagin8ion as well as in Brooklyn, NY hosted by James Murphy, a celebrity director for Project Imaginat10n. 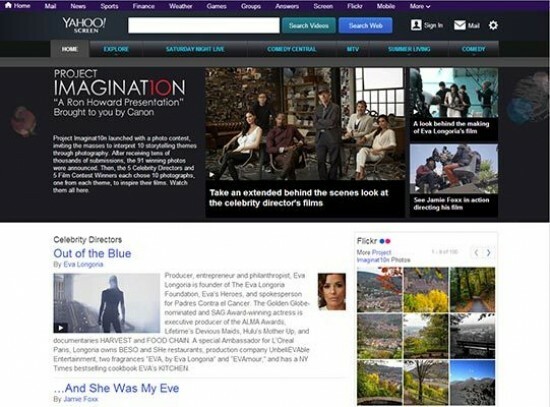 Yahoo Screen will continue celebrating the Film Festival from October 25, 2013 through the end of the year where consumers can view each of the 10 films. Proving Ron Howard’s words “we’re all creative,” five innovative celebrities took to the director’s chair – Jamie Foxx (Academy Award® winner), Eva Longoria (Golden Globe nominated and SAG Award winning actress), Georgina Chapman (designer and co-founder of Marchesa), James Murphy (founder of LCD SOUNDSYSTEM) and Biz Stone (co-founder of Twitter). The project launched with a photo contest, inviting the masses to interpret 10 storytelling themes through photography. After receiving thousands of submissions, 91 winning photos were announced. Then, the directors each chose nine photos, one from each theme, to inspire their films. A 10th photo in the Discovery theme, selected by Ron Howard, was utilized in all films to create a common thread. Canon gave consumers of all skill levels an opportunity to showcase their creativity and storytelling abilities by undertaking the same creative exercise—selecting photos from the same pool as the celebrity directors to inspire short films. With hundreds of user generated films submitted, Ron Howard and Bryce Dallas Howard selected five winning films. “I am so proud to be part of this creative journey with Canon, the impetus to ten inspiring, brave and audacious films that are a testament to the power of the imagination,” said Ron Howard. To take part in Canon’s Project Imaginat10n, the first film festival inspired by user-submitted photographs, consumers can visit: http://screen.yahoo.com. Freestyle Picture Company produced the five celebrity director films as well as Bryce Dallas Howard’s short filmwhen you find me as part of Canon’s Project Imagin8ion. Francesca Silvestri and Kevin Chinoy of Freestyle have a track record of shepherding first time directors. Grey New York, Canon’s agency partner for over thirty years, developed the creative and digital elements of the multi-phase campaign. Grey Activation and Public Relations managed the talent partnerships as well as the promotional, event and public relations efforts. For the latest news and announcements related to Project Imaginat10n follow @CanonUSAImaging on Twitter and join the conversation with #CanonPI10.